Are you looking for the right choice, that will keep you and your guests satisfied? We know you can be a satisfied hotel runner only if you have happy guests that will keep returning to you. We believe you have a proffesional attitude toward your guests and a sattisfiying service. But have you ever considered your guest's feelings can allso depend on the technological solutions and relliability of the devices your rooms offer to them? 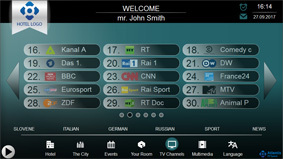 That is why our company offers you the state of the art quality solutions of the hotel TV system. We allways only use quality materials that will ensure long lifetime and the maintenance cost will be reduced to minimum. Consequently, the number of undesired interventions into a guest's room when occupied, is allso reduced so your guest is not unnecessarilly disturbed. Our projects are developed by first consulting the customer where we talk about the planned hotel guest nationallity, age and other structures so we can satisfy their needs optimally. When installing the solution, we allso take care of all the visual details, not only the mayor part of the work, as many companies that have only one short goal - to proffit by minimal input cost do. Our company offers antenna SMATV headends, interactive TV solutions, hotel mode TV sets by Philips and LG, digital signage system solutions, big TV screens, and finally allso the coax TV network and IPTV Lan network infrastructure deployment. 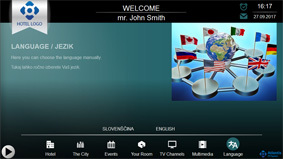 We are convinced hotel guests will be pleased by the TV if the TV set will have enough of TV channels in their language to make them feel at home, even if they are on the vacation. Suppliying the TV signal from a CATV or IPTV operator is only rational for a hotel with the majority of guest from the local country. Besides, the TV channels the TV set needs to offer a good quallity picture, be friendlly to operate for the guest and fast responsive. It should also avoid functional errors, such as having to reset the TV by unplugging it daily. Beside all this, there is allso an economical point of view. Our solutions are, in most cases, in the long term way cheaper than paying a monthlly TV supscription cost to a TV operator. 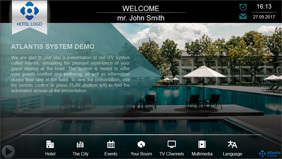 If your hotel is of higher class, you, of course, allso need a simple to use and reliable solution of the hotel interactive TV. 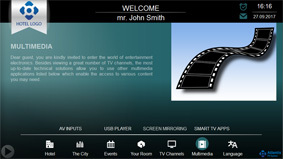 The digital system solution otionally supports the video on demand service. 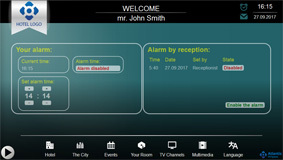 A hotel guest uses a single remote control unit to operate both, the TV and interactive services. 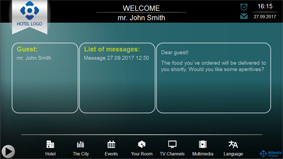 The system offers maximal graphical and functional personalisation of the hotel iTV menue. We are not an instant company that got its greath idea over night and plans to make a rapid agressive breaktrough. Such companies do not take in account the overall point of view that can leave their customers with many technical and other problems. The unexcpected feedback can eventually destroy them. Our company has a healthy growth. Years ago we first started our business with smaller projects and then moved to more complex ones by contemporarry upgrading our knowledge. We still continue to grow and develop. The projects we work on continue to be biger and more demanding and our services continue to be more proffesional and relliable. The proof is our list of references, where you can see we are getting to be choosen by bigger and better hotels. Our knowledge and quality is upgrade allso by a choice of proffesional tools and instruments we use at our work. We try to hear our customer's concerns and needs and consult them so they can make the best choice. Our biggest pleasure is when the customer is pleased. We know this is the only road ahead to continue a healthy growth of the company. To gain this, we put a lot of continious effort in a win-win attitude towards our customers. We do not do only headless input costs minimisation without considering the long-term consequences. That is the main reason why we bet on quallity. Due to our numerous experiences of installing and maintaining the TV systems in hotels, condominal buildings, retirement homes, hospitals, etc.. we emphasyze a greath deal on the fact the hotel guest or building owner does not wish to be disturbed by noise, etc.. The interactive TV system solutions that we offer enable the system to be allmost entirelly monitored and mantained extrernally, over its secured internet connection. If some TV channels change, we can reprogramme both the TV headend and the TV sets without even phisically arriving on site and entering the hotel rooms. This way a guest will not find »empty« TV channels in his room TV set. This page is optimised for viewing with IE 7 onwards and FireFoxom 10.0 onwards - AVSN © 2012-2018, all rights reserved - Made by: AVSN d.o.o.